Corbyn, who has a history of making anti-Semitic remarks, tweeted that it was "Great to speak to @AOC on the phone this evening and hear first hand how she’s challenging the status quo." He went on to talk about the importance of "build[ing] a movement across borders to take on the billionaires, polluters and migrant baiters, and support a happier, freer and cleaner planet." "It was an honor to share such a lovely and wide-reaching conversation with you, @jeremycorbyn!" Ocasio-Cortez said. "Also honored to share a great hope in the peace, prosperity, + justice that everyday people can create when we uplift one another across class, race, + identity both at home & abroad." 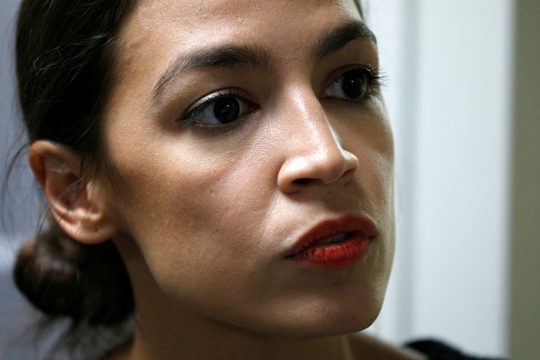 In response to Ocasio-Cortez's praise of Corbyn, Elad Nehorai, a writer for the Forward and Haaretz, warned Ocasio-Cortez of Corbyn's history of anti-Semitism. He said he hopes the congresswoman will "take a look at the amount of Jews trying to call attention to Corbyn’s long, documented history of anti-Semitism." "Hi @PopChassid – thank you for bringing this to me. We cannot + will not move forward without deep fellowship and leadership with the Jewish community. I’ll have my team reach out," Ocasio-Cortez responded. Ocasio-Cortez, a self-described democratic socialist, has a history of being critical of Israel. During her campaign, she tweeted that the killing of Palestinians at mass border protests by Israeli security forces was "a massacre." She has also tried to have it both ways on a two-state solution with Israel and the Palestinians depending on who is asking her about it. When asked whether she supported a two-state solution during an interview with the left-wing Democracy Now!, she said, "this is a conversation that I'm engaging with with activists right now." The Times of Israel outlines Corbyn's history of anti-Semitism, including his attendance at a memorial for terrorists who killed 11 Israelis at the Munich Olympic Games in 1972. His attendance at the event drew rebuke from Israeli Prime Minister Benjamin Netanyahu. In the 1980s, Corbyn sponsored and spoken for a group called the Labour Movement Campaign for Palestine whose official platform declared its "opposition to the Zionist state as racist, exclusivist, expansionist and a direct agency of imperialism." A conference it held in 1984 demanded that the Labour Party’s key institutions "support the Palestinian people in their struggle for a democratic and secular state in the whole of Palestine"; materials published by the movement for the event proclaimed that it sought "to eradicate Zionism." In 2009 Corbyn called Hamas and Hezbollah his "friends" and said that Hamas was working to achieve peace and justice; he subsequently apologized for the comment. In 2012 he defended an anti-Semitic mural — for which he also subsequently apologized. In 2013, he said British "Zionists" don’t understand British irony. In 2014 he laid flowers at a cemetery where Palestinian terrorists who murdered Israeli athletes in Munich in 1972 are buried. Appearing at a Labour Friends of Israel reception during his party’s annual conference in 2015, soon after he had been elected Labour leader, he was heckled after giving an address during which he did not mention the word "Israel." This entry was posted in Politics and tagged Alexandria Ocasio-Cortez, Anti-Semitism, Israel. Bookmark the permalink.